IMO, the hardest part with Kin is people trying to go too fast and screwing it up by healing him. It was faster in the long run to go "slower" and be more mindful of not healing it for us. We did SAM THF GEOx2 BRD WHM, if it matters. Kin is actually one of the more difficult bosses. It's annoying to do with any setup that has a single tank as you won't be able to avoid terror/5 second doom and you have to gate your damage. Gin/Fu/Kyou are all much easier than that. Has anybody tried Trueflight on Kei post patch? We've tried the following setup twice. We end up doing around okay damage with the skillchain although most of it is from Light/Radiance. I think it may resist physical damage. Even with Bolster Frailty, I don't think I had a Jishnu's Radiance break 15k. With Frailty/Chaos they do somewhere around 4~8k. We would have cleared it with this setup in around 25~30 minutes (very slow) but made some mistakes in the last 10% and wiped. I would rather not come out on mage jobs if it can be avoided. I think it may resist physical damage. My Fudos and auto-attacks do normal damage on Kin. Edit: Nvm, didn't catch you questioning on Kei. Looking through my logs, I do appear to do about half damage on Kei. The Terror isn't too much an issue as long as you know how to deal with it. [21:42:20]Kin uses Eleventh Dimension. No effect on Martel. [01:11:40]Kin uses Eleventh Dimension. No effect on Martel. [01:13:05]Kin uses Eleventh Dimension. No effect on Martel. [01:28:16]Kin uses Eleventh Dimension. Martel is terror. [01:08:33]Kin uses Eleventh Dimension. No effect on Martel. [01:11:09]Kin uses Eleventh Dimension. No effect on Martel. [01:16:20]Kin uses Eleventh Dimension. No effect on Martel. [01:02:09]Kin uses Eleventh Dimension. No effect on Martel. [01:07:11]Kin uses Eleventh Dimension. No effect on Martel. [00:32:19]Kin uses Eleventh Dimension. No effect on Martel. [01:14:00]Kin uses Eleventh Dimension. No effect on Martel. [01:24:53]Kin uses Eleventh Dimension. No effect on Martel. [00:57:22]Kin uses Eleventh Dimension. Martel is terror. [01:05:15]Kin uses Eleventh Dimension. No effect on Martel. [23:34:10]Kin uses Eleventh Dimension. No effect on Martel. [23:40:18]Kin uses Eleventh Dimension. Martel is terror. I left the few times in landed in there to make it a fair sample. Not immune, but very very resistant. Founder's Greaves+Sagasinger. This sample isn't larger enough for me to try to get a % value, and I think I may not have had Sagasinger on for one or two of those. But it's very high. Now we just need an ilvl remake of sagasinger. But well, I'm the tank not the DD, I'll let the DD do the DPS while I'm busy not getting terrored. An if he pulls hate, Cover is glorious in omen. First time it's been really useful in years. The main issue with this method is that PLD is the only tank that can wear Founder's or Sagasinger. SE kinda screwed the rest on that count. Also, any setup with a good WHM, and a tank that has cursna received gear has little to fear from doom. 5 count or not. I've yet to die from doom on Kin. Not that it was landing much pre-update. That part may have changed now though. One RNG needs a good trueflight set the other RNG and COR a good last stand set. You'll do about 60k+ dmg with close and skillchain most the time, and it's consistent and you never heal it. Bonus is skillchains actually get to do damage if you use magical WS on Kin using this setup so it's a pretty easy win. As far as target, it's really hard to keep hate off the trueflight ranger as is, so when target comes up RUN just stops using enmity abilities till I pull hate (usually next time I WS sometimes 2-3 WS). Not yet, but I haven't had issue using it on midbosses or Kin or any other mobs I used it on since the patch so it should be fine. In fact I only use my hate tools just enough to keep Kin's attention. A Flash/Foil/Stun at the beginning and then recast again only when/if I lose hate. This way it's much easier for someone else grab him after Target. WAR can also wear Founder's Greaves and Sagasinger (I've suggested it but our WAR lacks the sword so that's not happening.) We have also done it a few times using COR RNG RNG GEO SCH WAR but all said and done it's still much more difficult that way than Gin/Kyou/Fu. The RUN holds hate for awhile but eventually the DD's will pull hate with high damage Reso's going off every time it casts a spell. The idea is that we kinda share hate after awhile so that once Target happens it's looking at someone else within seconds and therefor we never have to deal with eleventh dimension. Really the trick to Kin is to just WS whenever it casts a spell and hold TP otherwise. Our last two Kin runs have been BST, WAR, SAM, GEO, BRD, WHM and take less than 5 minutes. Not saying it's hard just pointing out that claiming Kin is the easiest Omen boss is an overstatement. Each of these is designed to be easier towards a specific job type, though not entirely impossible for alternate setups. Kin/Gin/Kyou are more melee / ranged orientated while Fu revolves around pet jobs and Kei is for magic. If your using melee then focus on melee buffs and abilities. If your focusing on ranged then focus on ranged buffs, if using pets then focus on pets and magic then focus on magic. Mixing them is terribad because your forced to spread your buffs around or someone ends up gimped in damage and another person mediocre. Our last Kin fight with that setup took just over 5 minutes. I wouldn't call that hard. You're boss setup generalizations are also totally wrong. Our average clear time on Fu is around 3 minutes with no specific setup in particular. I've also cleared Gin in 3 minutes with just four players. Again, I'm not saying Kin is hard, just that it's not the easiest Omen boss. I've done DD setups for Kin, they have mixed success. The worst case one was one that took 25 mins and still timed out due to DD skillchaining when it casts too often, or dying to AoE. And making up for lost time is time consuming because you have to hurry up and wait for it to cast. I did have some good DD wins too, but I just find it really depends not only on the DD but how well they will work together where as it's pretty hard to mess up the RNG strat. The best DD win I had was actually NIN spamming blade:ten when it casts and when it's not doing tp moves. I like the RNG strat I posted most because you're doing damage at all points of the fight, and skillchain damage works for it unlike any DD setup without magical ws. Also when I do Kei as TF RNG, every tank I've ever taken constantly loses hate to the RNG, but it's still fast enough and safe enough that it's my preferred setup. 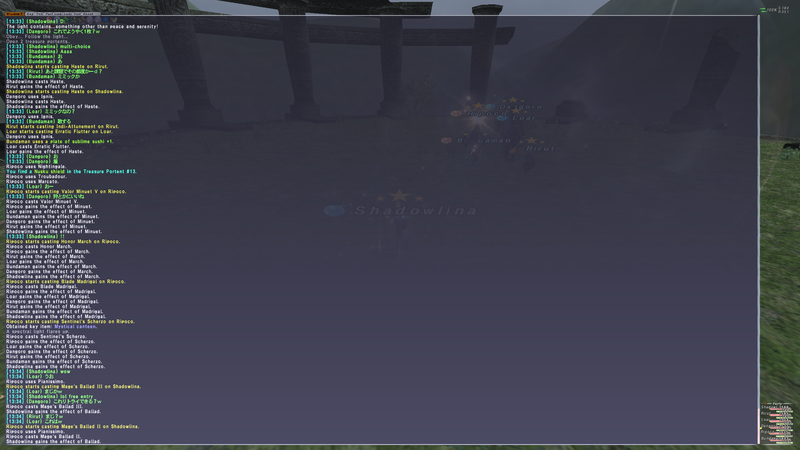 So far every end omen boss works really well with trueflight ranger, and SMN as well. Gin when it changes to light absorb, I do have to use physical WS though, but still works for a large part of the fight. hey!!! i don't know if this was asked before but if u choose to skip Boss in 3rd floor u can't do Boss on 5th floor? so u get 10 objective in floor 3 and 5? farm cards any job!? I used 70(71)0 Shapshot, 34 Velocity Shot, and some amount of Rapid Shot (56 assuming Rapid Shot II gives 30%). No boss if you skip the sub boss. 10 objectives on floor 4. There is no floor 3 or 5. I got 6 cards today on my Sam and Drk mules. Completed 2/3 objectives on floors 1,2, and 7/10 on floor 4. Floor 1 was specific mob but I ended up killing all of them since it was the last mob that opened the portal. Floor 2 was kill all. Floor 4 was kill all transcended mobs. I cleared out most of floor 4 for merits and JP after doing all the objectives. My Blu mules have been getting only 3 cards per run. I think the key to Kin here, and why WAR and DRK work particularly well together on Kin, is skill chain damage. For instance using BLU over DRK or WAR means making Distortion with reso -> cdc which makes the fight significantly longer meaning more interferences and more dooms. So having WAR WAR or WAR DRK or DRK DRK for DDs makes a big difference, or just even using non skillchaining ws's. I think the key to Kin is...smart DD's. I've done it THF+COR, and recently been doing it RUN+COR. Had no issues, killed fast though final 25% takes a bit longer because of constant tp spam, not even close to timing out at any point. The BLU's were stupid, plain and simple. There is a high damage WS that BLU has, it's extremely powerful because it has awesome TP scaling so holding TP won't cause much DPS loss. That WS also doesn't SC with itself or anything else in the fragmentation category. It's *** Savage Blade. People need to wake up and think about these things, both DD's need to find a WS that they can do together that won't SC or time their WS's so they happen simultaneously. I was with a very good geared blu, tiz/alamce using expiacion/savage (expi will sc, so he used it wisely only at 3k tp for his AM). I parsed 53% he did 37% and the rng made up the rest with run tank. This is pretty consistent most runs too. Drk is just crazy useful on the nm, with the killer effects/arcane circle/arcane crest, I just cant envision other dds being much more useful. You have a ranger parsing less than 10%? Why are they in your group? At this point, Fu/Kin/Gin are pretty easy and can be steamrolled with just about any above average DD. I don't think it's exclusive to any best jobs in particular. 3f are still more dangerous than the damn 5Fs. Agreed. Midbosses can be a bigger ***than the end boss, mostly just view sync guy, occasionally pain sync. My group usually uses 1hrs on mid, my conduit can usually trounce them unless i get an early pain sync or an unresisted view/carousel. Af/ac'd & gob'd conduit with bolstered frailty and i'm hitting for between 60k and 99k with volt/chaotic strike. How is Kyou not the same? Just have your tank die every Bravado and continue as normal. Kei is the only one that's a true change of pace from my experience as he's clearly designed around a manaburn strategy. None of the 3rd floor bosses are difficult, they're just easier to *** up. Gorger's Spirit Absorption can still destroy things though MDB seems to reduce it but I've been burning it down so quick lately it doesn't really get as much opportunity to do hate resets and jump to different target. Pain Sync is still dangerous but less frequent so a tad easier to handle and Craver is never an issue with Wilt. A Thread Specifically for Omen. Figured i'd make one so we can stop raiding the December update thread. Floor 3.5: Randomly?? Occurrence lucky room. Body -> 10 Paragon Cards. Legs -> 9 Paragon Cards. Feet -> 6 Paragon cards. Body -> 50 Paragon Cards. Legs -> 45 Paragon Cards. Feet -> 30 Paragon cards. The +3 Scales required are split via jobs. Whether this was a lucky random room I don't presently know. Each one has a Unique abillity! Yay! Also their all Empty Mob types. Glassy Gorger -> Blessings Something: Copies everyones around its buffs. 10"? Maybe. Kin was more tricky and we ran out of time here. He absorbs Phys dmg during TP moves and magic dmg during spell casts. He has moderatly high Eva. 1.3k or what I had as Acc was not enough to cap. His special move seems to be called Malign Invocation. Massive dmg AoE with amnesia, goes through shadows but is absorbed by Migawari. He has the usually doom and curse and bio moves but nothing scary. Actually Nin was a very good tank here as well. Our Pld died to Doom early and I had no problem tanking it. He casts some week spells like drain, aspir , freeze, comet....no idea if it gets stronger at the end. I highly assume so. Used benediction at 53%, and a special TP move (Dancing Fullers) at 75%, 50%, 25%, and 10% that does 2500 base dmg x the number of people in range, Including lupons. (BLU + lupon in range= 7500 dmg) Scherzo was on, still did 7500dmg. Has elemental spikes effect, and changes them often. (indicating what element to nuke it with) It absorbs everything else. Every 25% does some kind of 10 000 needle move. Starts to spam Meteor sub 25% total HP. Lots of add-effects on his melee hits including Curse to lower HP by 50% ish. Purges debuffs regularly and buffs himself with Pro/Shell. Meteor spam gave us the final blow. He can also do 1000 Fists. Meteor sub 25% is 25 range. RNG and COR shooting it at 23 can outrun it easily so healer can focus on tank when needed. We just let our PLD eat the big WS each time and arised him. Opens with a 20" Buff Absorb/Wipe (Ebullient Nullification). Casts Paralyze, Paralyaga, Poisonaga II, Water V, Blizzaga IV. Uses Stygian Cyclone, Malign Invocation, Hellish Crescendo, Deathly Diminuendo and it's Special attack as mentioned above. Certain buffs make it rage to do this Buff absorb. When Enraged he takes extra damage. Alternatively, you can trade 10 cards of 1 type, to be traded for 1 card of another type. Completing a set will give you a card drop!! *Heal x amount or more X amount of times. *Use X amount of Job Abilities on X amount of times. *Weapon skill for X amount of Damage X amount of times. *Kill X amount of enemies. *Weapon skill X amount of times. *Magic Burst X amount of times. *Melee hit for X amount of damage X amount of times. Glassy Thinker: Adad Amulet, Adapa Shield. Glassy Gorger: Kishar Ring, Enki Strap, Erra Pendent.